Buy Nothing and Learn Lots! (buy as little as possible and the slowly figure out what I need). Buy Equipment That Will Save You Money! Buy Equipment That Improves the Life of Your Livestock! Buy Equipment That Saves You Time! So with these simple rules in mind I am about to embrace the world of the Freegan. Sourcing all kinds of materials, tools and even food for the animals from places that no longer need them. Since leaving work in February I have been trying to live as frugally as possible and it has really struck me how little we actually need, how much waste we produce and how I would buy things I didn't even use. I am not trying to preach to anyone, if anything I am chastising myself for all the money I have wasted in the past and actually I'm looking forward to being more innovative and social in my pursuit of the Freegan lifestyle. 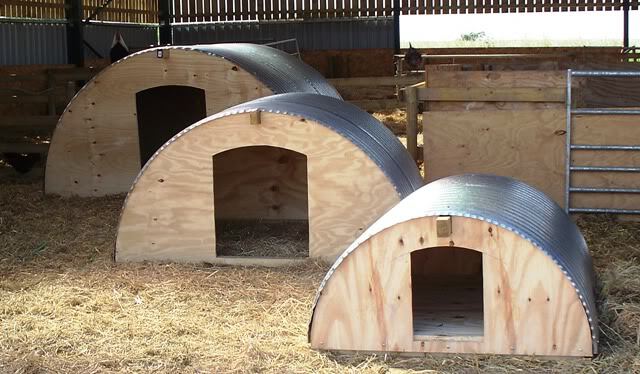 - Pig Ark (Shelter). I am going to need a few of these and I have found some really easy plans for them so job number one is to buy the materials and make 3 or 4 of them. For that I will need wood, electric jigsaw, a hammer and patience. [caption id="attachment_74" align="aligncenter" width="640"] Each sow needs one of these to give birth in. I plan to have at least 8 Sows[/caption] - Tractor (with a loader). Oh yes a big red tractor, every boys dream until about the age of ten when they turn to Ferrari instead. - Live stock Trailer. Actually I firstly need to get a tow bar fitted on my car and then learn how to drive with a trailor on the back (especially when going in reverse). - Ride On Lawn Mower (and petrol strimmer). This is not really a farm purchase but if I don't get one the 1.5 acres around the house will soon look like a jungle. - Post Hole Digger. The farm is quite well fenced but I will need to put alot of fence in to make smaller paddocks, I am not looking forward to this as its costly and HARD work. - Plow, Disk, Harrow, Seeder, Baler. All of these are needed if I am going to start growing crops to feed the animals (and the pigs...) - Spade, Shovel, Rake, Branch cutters, Axe, Pickaxe, Sledgehammer, Hay Rake and a hundred other hand tools - Chainsaw. Just so I can scare the neighbours. Infact the only farm 'tool' I have at the moment is a green Land Rover Defender, which comes with the house, whilst it makes me look the part I am not sure its going to help me make money. OK, I am off to pretend to sleep and ruminate some more.